Section 1. 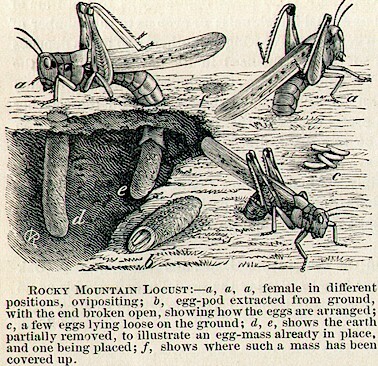 Any person that gathers or employs persons to gather the eggs of the Rocky Mountain locust or grasshopper,at any time after they are deposited in the earth in the autumn of any year, and before they are hatched the following spring, will receive five dollars for every bushel of eggs that are gathered. Any quantity under a bushel will receive a bounty at the same rate, to be paid, one-half of the bounty paid by the State and one-half of the bounty paid by the county in which the grasshoppers or locusts were gathered. Section 2. Any person who gather, collects, and kills young and unfledged grasshoppers in the month of March, will receive a payment of one dollar for each bushel. In the month of April a payment of fifty cents would be received per bushel. In the month of May, twenty-five cents was received per bushel, to be paid as the preceding section. Section 3. Any person that claims payments under this act shall have to produce the eggs of the grasshoppers before the clerk of the county court in which such eggs were disposed of within ten days thereafter. The acting clerk would then administer the person the following oath or affirmation: You do solemnly swear (or affirm, as the case may be,) that the eggs (or grasshoppers,) produced by you, were taken and gathered by you, or by person or persons in your employ, or under your control, and within this county and State. This certificate then will be received and taken by the collector of revenue for the county. The collector shall be allowed pay out of the county and State treasury. Section 5. The acting clerks will then keep a register of all such certificates given by him, in a record book, in which he shall note every transaction granted by him, which includes the number and amount, and to whom the amount was granted to. A certified copy then will be sent to the treasurer of the State, who shall not allow and pay and certificate which does not correspond with such register. Section 6. The acting clerk then will receive for such certified copy of the register, and the regular fee for the certificate and seal, and ten cents for each certificate granted under this act, all to be paid out of the treasury of his county. Section 7. As the object of this act is the rapid destruction of the locust the ensuing spring, it shall take effect and be in force and after its passage. This etching is from the 1874 Missouri Entomologist's report. Can you imagine how hard it would be to collect a bushel of grasshopper eggs! This page was designed and is maintained by Doug Pascoe and Lyndon N. Irwin.